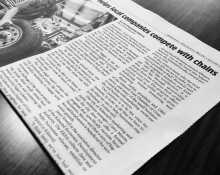 The Journal Record recently featured our Edmond Locally Owned (ELO) program and what it means to be a small business in Edmond. We have partnered with Staples Business Advantage to bring you a best-in-class business supply discount program that delivers value through negotiated savings and superior customer service. Many businesses across America have been impacted by the latest WannaCry ransomware. What are you doing to protect yourself and your business? Participants in the Leadership Edmond and Youth Leadership Edmond programs recently graduated. To find out more about these programs, please visit our Committees & Programs page. The Edmond Area Chamber of Commerce is excited to introduce the new website officially on May 10 of 2017!